When I (Dave) first saw the lyrics, I said, "William, Tiananmen Square happened in 1989!" He said, "Yeah, but it's been bugging me." As this song is written in response to the Spintunes 6, Round 3 challenge, it's supposed to be about something you feel strongly about. I'd say 24 years of simmering qualifies. 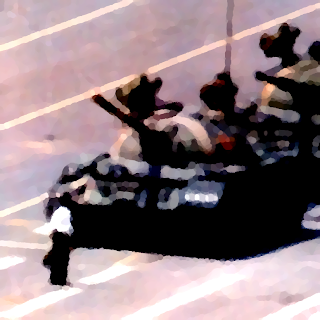 A painting of the infamous "Tank Man"
The incident struck a chord with us, as it did with most Americans, touched by the spirit of the Chinese students who stood up for their Liberty. Like our own Founding Fathers, they made a difficult choice to seek Liberty over their security. In an oppressive society you can accept the security of state control or you can fight for individual freedom; you cannot have both. We're not telling you in this song what you should choose, though I think our own bias is pretty clear. This isn't a cop-out... it's part of the message we're sending. This is a protest against political complacency. We're sick to death of people telling you what you want. The people of this world demand societies that are both free and socialist, to various degrees. To us, what's more important than whether you choose either individual liberty or security is that you make the choice. Don't let someone do it for you. And once you've made your choice, stand up and defend it. Be the Tank Man. Notes on the music continue after the lyrics. We can fight for them still! More than a billion strong! As for the style of the song... in the first place, I'm not Chinese, and I don't know enough about the culture to make intelligent musical decisions; so no, I wasn't about to try for some Oriental song stylings here. It would wind up sounding like "Hong Kong Fooey". In the second place, the event was one in which the students involved were trying very much to adopt Western-style democracy (up to and including displaying a statue of the "Goddess of Democracy", so very similar to the Statue of Liberty that graces New York's harbor). A Western-style song seemed to me to be in order. I started with a 12/8 time signature, reminiscent of the old Perry Mason theme song, which reminds me not only of Justice, but of the L.A. Chinatown near which the fictional lawyer practiced his profession. The distinct "nightclub" feel allows for the dynamic range pretty much demanded by the chorus. I tried delivering the vocals in various ways, but always wound up belting out that last chorus when it got to the "every battle needs survivors" line. Though my voice is not ideal for this, I finally just gave up and went with it. I agonized more over the use of the word "comrade" than anything else in this song. Originally, William wrote "fathers", and that gave us the problem where we switch perspective after the first verse. Unacceptable. After a couple of attempts to re-write the verse, I decided on "comrade", even though it could be considered to be uncharacteristic embracing of the principles these student demonstrators were rejecting. I used it for two reasons: 1. it's the best word for the job; despite the leftist connotation. These are friends, compatriots, comrades. 2. used in the modern day context, it's ironic. Yes, they attempted to embrace Democracy, but they lost. Today you can't even do a web search for "Tiananmen Square" in mainland China without shutting down your Internet connection. So in referring to the fallen, they do so from within the confines of the yoke they are forced to wear. "Fear itself often frightens me too" harks back to FDR's statement, which in context was this: "So, first of all, let me assert my firm belief that the only thing we have to fear is fear itself—nameless, unreasoning, unjustified terror which paralyzes needed efforts to convert retreat into advance." When the Chinese students determined that they'd make it work "Not just for freedom, but for peace" their cause was doomed. American independence worked because we fought for it. Indian independence was won because they persevered. But the fact that these students stood up, even for a short time, is something to be admired. They have the spark. They need the flame. They needed to persevere, rejecting their fear of the tanks and the guns. The only way for that to happen is to keep the spark alive, and try again when the season is right. Hence, "we'll return again in the Spring", invoking the memory of the recent "Arab Spring". And of course the actual date and time of that "Spring" is irrelevant. That verse is about Hope, and hope springs eternal. Taken together, these verses are not about inciting people to a new protest, but encouraging a protest that is already underway. I felt uncomfortable hearing you bad-mouth your own song on Facebook. As a product, I'd like to hear better production. The instruments don't sound like they're playing in the same place and overall it could be better mixed. That said, I know that's not your thing. You guys are songwriters, and as a song this works very well. I don't know if it was your conscious intention or if you just have great instincts, but the descending baseline and chord roots for the sadder, first parts of the stanzas mate very well with the rising pattern when the stanza comes to a close, in all but one case (1st stanza after the 1st "Peace or Freedom") sung with somewhat more optimistic lyrics. And rising even a bit farther than expected to the bVI (matching the end of the descending part) before resolving gives it an extra push as well as color for going ever so briefly out of key. In the melody, at first I was unsure of the tentative nature of landing "Square" on the 5th. It felt a bit weak for the end of the first line where you establish the setting of the song. But the more I hear, the more I understand that it SHOULD be somewhat weak at that point. You're not proclaiming it as a matter of pride, but almost tentatively, like it's something you're simply acknowledging. All this signals to me a songwriter who treats composition as a craft, and it feels obvious to me that William has given this a lot of thought. Spring being capitalized... a reference to the Chinese New Year (Chinese Spring Festival) combined with a plea to recreate an Arab Spring appropriate to their country? Thanks, Brian! Yes, you have the Arab Spring reference spot-on. Also "Hope springs eternal", as the verse there is about Hope. And also about landing "Square" on the 5th. It's weak there on purpose. What we know as the songwriters and you don't (on first listen) is that these people are defeated. Their involvement is not something they CAN say with pride in their current environment. So it is with a bit of sadness that they share their memories. That descending bass is intended to take you there. The first time we hit the chorus, it's a set-up. Though it's practically identical to the second occurrence, we're leading in from a sadder verse, so in context it seems less emphatic, as if the singer is trying to convince (or remind) himself. It's not until "more than a billion strong" that he shakes that off and that same chorus becomes a challenge. Writing songs to these challenges is a craft. We go nuts on little details, and given time, the song changes until it stops changing, at which point it's right. It's rarely "right" for us in the mere week we have to write it (And I mean "song-wise"... we never care about the production. I just made a "final" revision to my first-ever SpinTunes entry, and am ready to re-record it... it's stuck in my head). I've just revised the above post to include a couple of more notes about the lyrics. We LIKE what we write. We feel our music is distinctive because no one else writes what we want to hear. Tastes vary. I've been told, for instance, that our choice of rhythm is sometimes odd or that we're mixing styles "inappropriately". When we do those things it is absolutely 100% on purpose. We write for our tastes, and if we wanted to write for others' we'd have very different product. But we're not in it for them, we're in it for us, as a mental exercise in meeting the challenges and so that there will exist more music of the type we personally like. We already make a pretty big concession regarding the time I spend on production, as William and I are perfectly content to listen to a raw piano demo and fill in everything else with our imaginations. You wouldn't BELIEVE what we hear. Keep in mind, though, that I'm not "bad-mouthing" our song on Facebook. But I'm assessing our chances of advancement against the other songs of the round, and being (I think) objective about it. Nevertheless, we have some historical precedence regarding the judges' preferences to go by. With 20+ previous SpinTunes rounds of data, we think we have a fairly accurate gauge as to the relative importance of production, or vocal quality, or re-playability, or pop-culture references in these songs. We know that we typically fare somewhat better in popular votes than we do with judging. We believe that we will not move on to the next round. That's cool... this round is FULL of great songs, and being here just means that ours is one of them. That's not to say we don't like our song... we ALWAYS like our song. In fact, we like ALL THREE songs we produced this round, and left it up to others to decide which one was the official entry. Personally, I like "Memory of a Future Past" best of the three. Just guitar and bass, neither of which are played expertly, but I like the imagery in both the lyrics and the tune. We don't think we've ever written a really crappy song. However, we HAVE started a lot of songs that aren't really done yet.